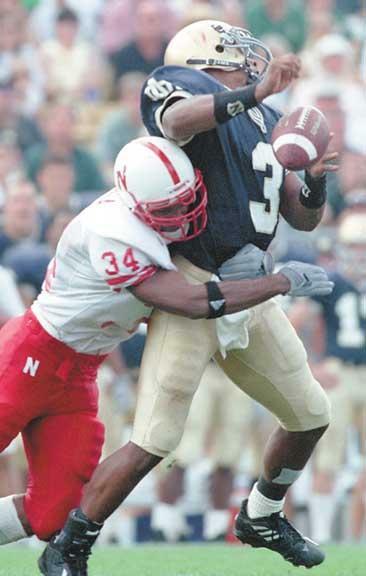 On September 9, 2000, the #1 ranked Nebraska Cornhuskers traveled to South Bend to play the #23 ranked Notre Dame Fighting Irish. My father and brother had purchased their tickets for this game weeks in advance and were really excited. For my brother, David, it would be the first time he has seen the Nebraska Cornhuskers play in person. My father recounted his experiences of just before the game to me. When they arrived, they had to park on the other side of the campus from the stadium and had to walk about a mile and a half. He noticed that the buildings were very historic looking, even the trees were old. The campus was well kept and extremely clean. 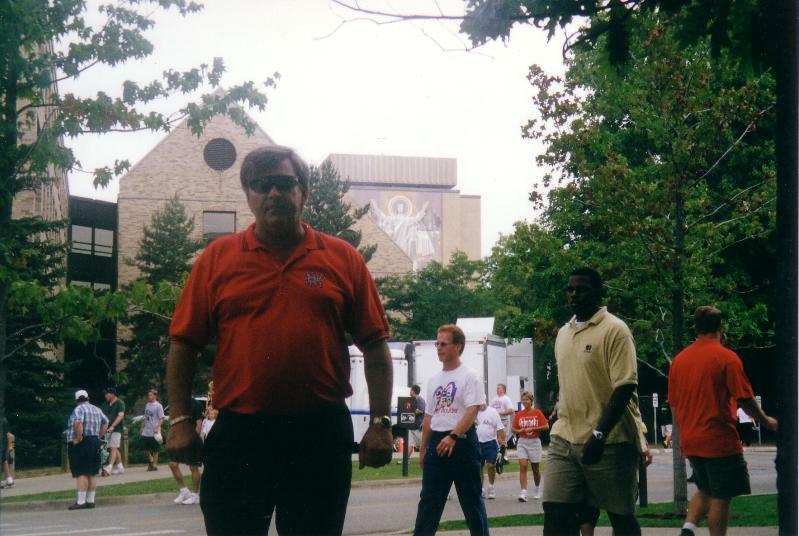 As he was making his way to the stadium, he couldn't help but think there seems to be a lot of Nebraska fans on campus. My father and brother took in the sights. They took pictures in front of "Touchdown Jesus." They even watched the College Game Day show being aired. The closer they got to the stadium, the more red they saw. They overheard some Notre Dame fams talking about how many Nebraska fans were there, but the Fighting Irish fans made the comment that not all of them had tickets. My dad and brother got their tickets out and entered the stadium approximately an hour before the game began. 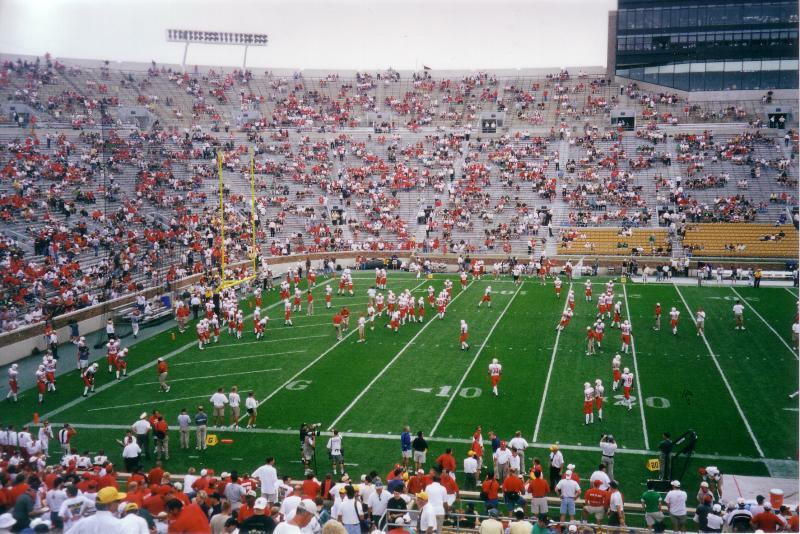 The stadium was still pretty empty at that time and the Nebraska players were warming up on the field. As the stadium began to fill up, my father began taking pictures of the fans. He could see red flowing through the tunnels leading to the seats. He figured the flow would stop eventually, but it never did. 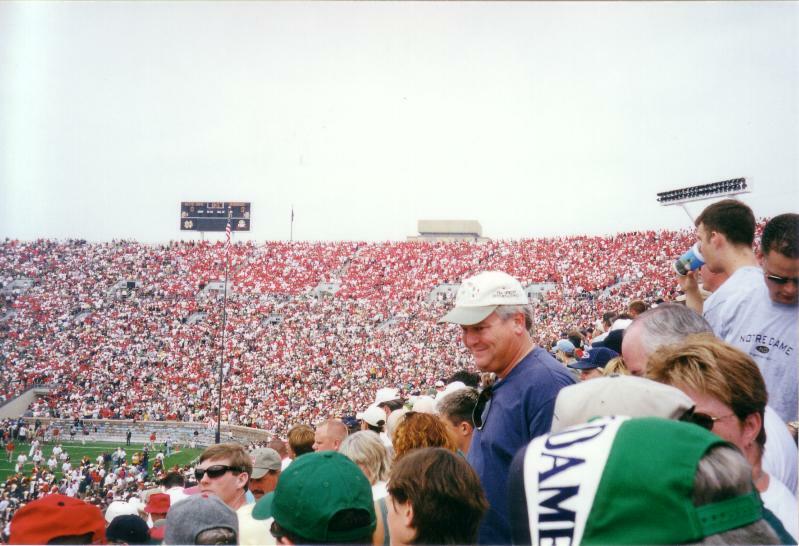 The entire stadium filled with red with a few patches of green representing the Irish fans. While my father and brother were experiencing this phenomenon in person, I was home watching it on television. 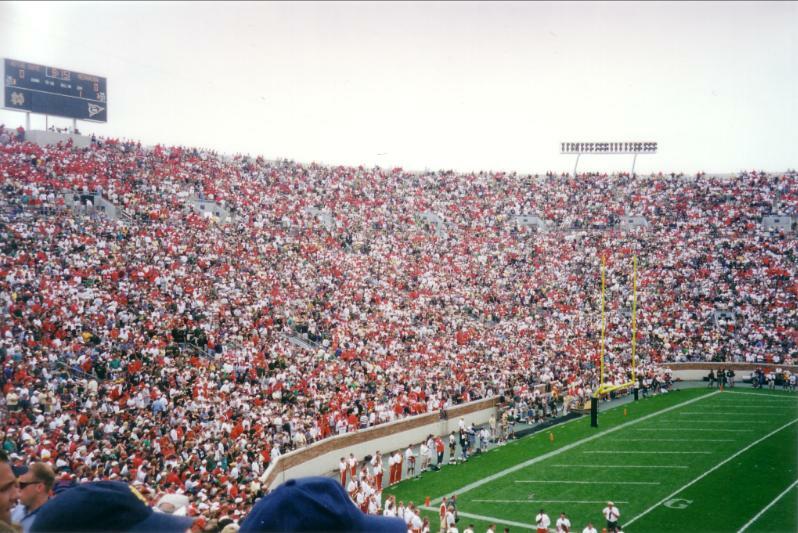 When I saw the first shots of the stadium, I almost thought we were playing in Lincoln instead of South Bend for all the red that was there. Even the comentators mentioend that Notre Dame fans must have sold their tickets to Nebraska fans. The atmosphere in the stadium was more like a bowl game than an early season game. When the teams were introduced, neither side had home field advantage as far as the intensity of the fans. Throughout the first quarter, both teams were matched equally. Both teams had short gains, but neither really were able to move the ball. 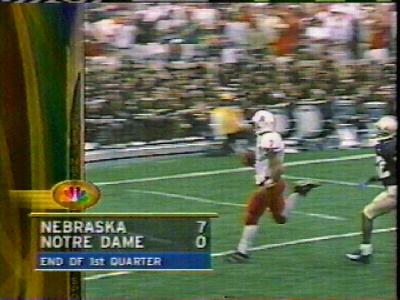 However, with a few minutes left in the first quarter, Eric Crouch scored on a 62 yd run putting the Cornhuskers up 7 to 0. The second quarter was a little different. Both teams had settled down and were able to move the ball against each other. 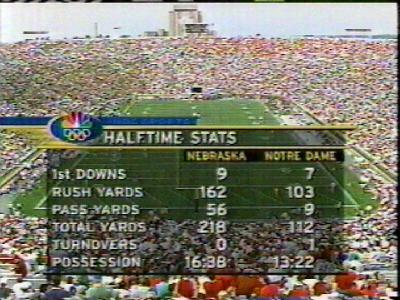 Notre Dame was able to sustain a drive culminating in a 2 yard touchdown run by Tony Fisher which tied the game 7 to 7. On the very next drive, Crouch scored on a quarterback keeper to make the game 14 to 7 at the half. In the third quarter, Dan Alexander made a remarkable cut to the left and scored on a 28 yard run making the score 21 to 7. 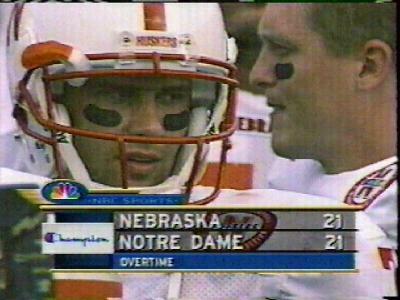 This score gave all those watching the impression that Nebraska was going to run away with the game. That feeling was short lived. On the very next kickoff, Julius Jones returned it for 100 yards on an extremely well executed play. This was a weakness that Nebraska had had all day. They were unable to stop Notre Dame on kickoffs and it was just a matter of time until something like Jones' 100 yard run happened. The score was now 21 to 14. The fourth quarter was played pretty close to the vest. Neither offense scored. The only score that occurred was an 83 yard punt return by the Irish's Joey Getherall tieing the game at 21 to 21 and putting it into overtime. 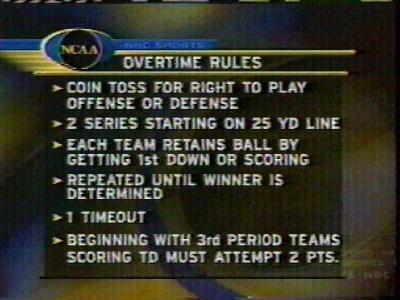 I remember at the break thinking my father and brother must be going crazy with the game going into overtime. However, I felt pretty confifdent that we had a good chance at winning the game because there are no punts or kickoffs during overtime that Notre Dame could score on. Notre Dame won the toss and had the first possession. Their drive stalled out and they had to settle for a 29 yard field goal by Nick Setta. It was now Nebraska's turn on offense. 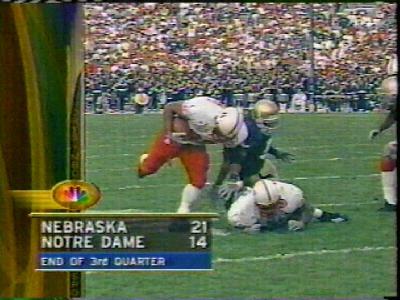 I almost thought we were going to have to settle for a field goal and go into a second overtime when Eric Crouch was faced with a third and nine and was able to complete a pass to Tracey Wistrom for a first down. A few plays later Crouch ended the game with a run to his left for a 7 yard TD scamper. 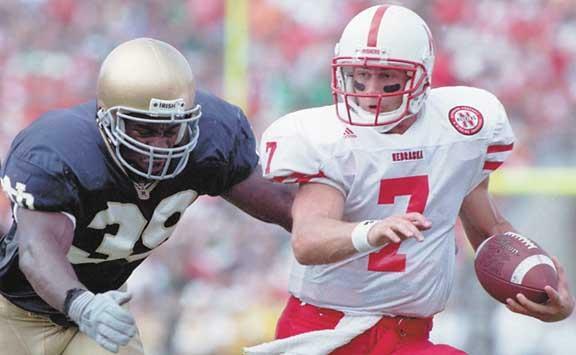 Nebraska beat Notre Dame in overtime 27 to 24. I was thinking that my brother and dad would be hoarse when the came home due to all the screaming they did. It was one of the greatest football games I have ever seen. 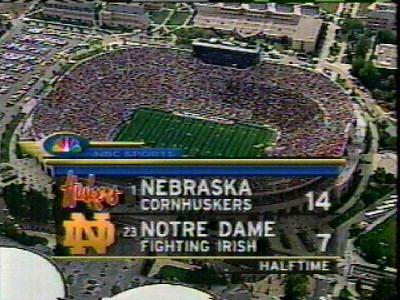 I will always remember the day the Cornhusker Nation invaded South Bend. "Getherall 83 yard punt return"
"Setta 29 yard field goal"